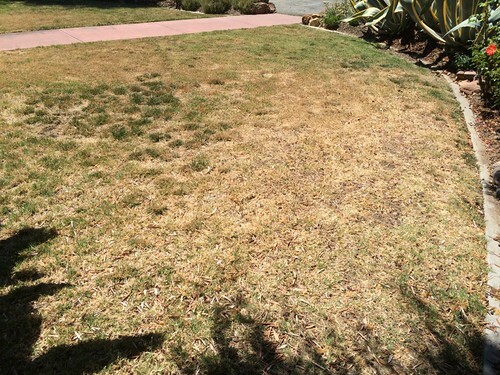 “Pre-Inspection Survey” by Conservision – in which our eligible landscaping was officially measured and evaluated and reported to SCVWD, 8 May 2015. Returned “Landscape Rebate Program Request for Application Form” to SCVWD, 8 May 2015. 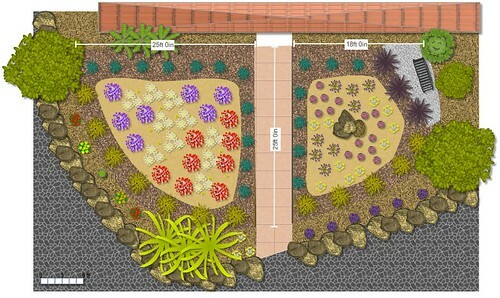 Returned “Landscape Rebate Program Application Form” to SCVWD – mailed 22 June 2015, complete with detailed garden diagrams (created using Garden Planner software) with plant, materials, and irrigation equipment lists. This required much cross checking of the Sunset Western Garden Book against the SCVWD Qualifying Plant List – as well as family discussions about what we want at the end of this process. Received “Notice to Proceed” from SCVWD, dated 28 July 2015. In designing the new garden, I was very disappointed that many of the California native plants I had originally thought to use in my landscape design were marked in the Qualifying Plant List as having “Genetic Concerns”. I think most home gardeners will be like me – unwilling to hire/pay a plant ecologist (or find a qualifying native plant database) to determine the local wild populations. I ended up picking from listed plants that are non-natives. I have 90 days from 28 July to finish!